One of a kind rental, because it is on a canal off the headsprings of the Homosassa River. Swim with the manatees very near the house in the winter months. They gather in the clear waters just 300 yards away, a short kayak, and kayaks included. The water is always 72 degrees so don't let the cold air scare you off, it is quite pleasant. You are also allowed a 10% discount at Bird's Underwater Dive Center who manages the house. You can take a tour with them on the Crystal River with your discoulnt or they will loan you masks and snorkels if you would rather go it alone from the house. This clean, popular house has been a rental unit for 11 years and many people return, very good reviews. The Homosassa Springs State park is across the street and over a short foot bridge. There are two docks, you can fish, or sit and enjoy a fire on the gas burning fire pit. This is the Only vacation rental unit in Homosassa within 300 yards of the clear freshwater springs. Two-night minimum stay. Screened-in back porch overlooking canal. Spacious backyard with banana, grapefruit, and fig trees. Canal has direct access to the Gulf of Mexico. Lots of unique waterfront restaurants that specialize in fresh seafood in this little old Florida town. Paddle to the clear fresh waters of Homosassa River outside of the Ellie Schiller Homosassa Springs Wildlife State Park, see their website. Manatees gather 300 yards from house to winter in 72-degree water. You may swim with manatees. House owned by Birds Underwater Dive Center, see website, who will rent you necessary snorkel gear and explain rules of engagement with manatees. Canal view from spacious backyard. 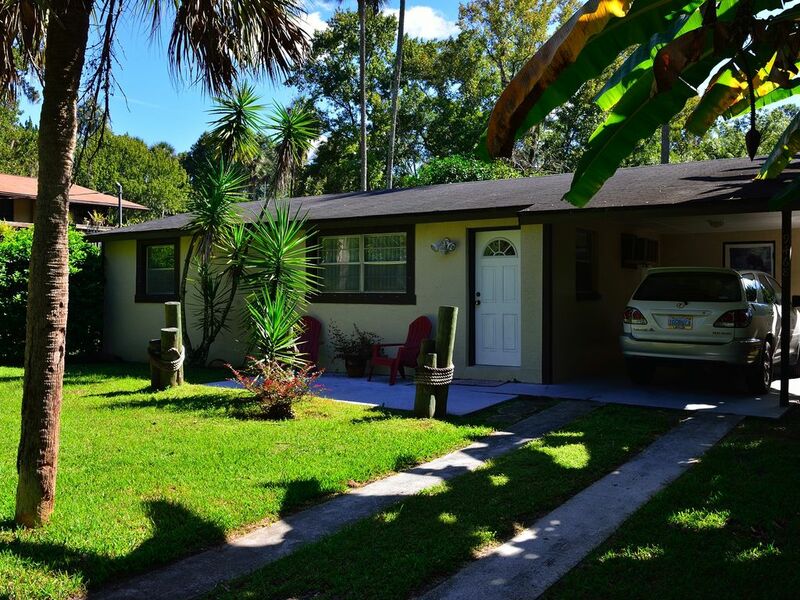 Located on a canal near the State Park and head springs of the Homosassa River with direct access to the Gulf of Mexico. One of a kind rental! WiFi included For the privacy of our clients we do not provide driving directions. We do not want drive by’s. They must call the shop for directions and come here and get the key as well. Awesome place, super cute, super clean! We had an amazing time and will definitely be returning! Went kayaking several times, manatees were so incredible. The location is fantastic, the neighbors were super friendly. It was everything we could have asked for and more. We had a very nice stay. The house is as advertised, very comfortable. The kayaks were easy to launch from backyard. It was beautiful. We will be going back there. The property and house are great! Everything you could need, by the water and kayaks to use. My friend and I did Swimming with the Manatees which is located right up the street. Also highly recommend Crumps restaurant for a great view and good food. Would definitely come stay again! Thank you for your kind comments, will try to roll out the red carpet next time. Make the memories! Diane O. We enjoyed kayaking to see the manatee. The home was very clean. Our family had a wonderful time their and would highly recommend to others. My family and I loved this place!! We stayed with our two daughters (ages 7 and 10). House was super clean and we loved being right on the canal and using the kayaks. Paddled out both days and saw so many manatees, birds, turtles, fish, and otters. You really can't get a better location if you're coming to paddle the river. We wished we would have stayed here longer rather than going to Orlando. Went on a manatee snorkel tour with Birds Underwater and it was SPECTACULAR even in the 39 degree morning cold! Only negative of the stay was in the middle of the afternoon when we were sitting outside on the porch enjoying nature, the lawn care person came and chopped down the banana tree forest that my girls loved to play in and continued to mow, weed-wack, and trim the hedges which made us change our plans for the afternoon as it was super noisy. But would certainly stay here again. My family and I had a GREAT stay, we'll be booking again! I've always stayed at hotels for the past 20 years when visiting Crystal River and the manatees. This was a much better experience than booking several rooms. My family stayed together, we cooked in the full kitchen and ate outside on the nice patio and hung out by the fire on the docks in the evening. There was all types of wild life from manatee at the dock in the morning to birds like herons. We used the kayaks several times and it's a very short and easy paddle out to shallow water where you can swim and snorkel or just enjoy time on the water. The house was clean and in a very good location only 7 miles away from Birds Underwater DIve shop where we'd go out on manatee tours and just down the road from Homosassa springs state park. Internet was fast, we didn't watch much tv but there are 2, there's a washer / dryer and everything you need for a comfortable stay. The house is also just about a mile away from a publix and a few restaurants if you don't want to cook or need supplies. I highly recommend! Thanks for sharing your comments. It is better to get a house than several motel rooms and less expensive. Hope to see you again in the future!! One of a Kind Rental! Kayaks provided for access to the head springs of the Homosassa River. Canal has direct access to the Gulf of Mexico. Ellie Schiller Homosassa Springs Wildlife State Park is within walking distance. Manatee Snorkel Tours and Eco Tours available at Bird's Underwater Dive Center with a 10% discount on Manatee Tours for house guests. Scuba diving gear also available at Bird's Underwater. For larger groups see our listing #12055 on the Hall's River.